I know this is short notice, but I will be at Abel Keppy Animal Care Center located ath 612 West 1st St, Milan, IL for their Pet Parade and Open House. I will have a Halloween backdrop with plenty of props to create spooky portraits of your costumed pet. They will have basket giveaways, a room of horrors and treats for pets and their humans. So, dress your pet in it's spookiest attire and join us for a couple hours Saturday October 13th, 2012 from noon to 2PM. I dare you to be there ... bwhahahahahahahahahaha .....! Abel Keppy's Open House was a GREAT Success! We had a full house and enjoyed all the costumed pets! Thank you for visiting my website and for leaving me a comment! Have a pawsitively GREAT day! Welcome to Say Woof! Petography (formerly Frankz Paw Printz), hosted by me, Renae Crevalle. 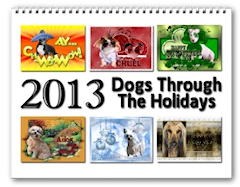 Within these pages, you'll discover how my love of Dogs, Photography and my Graphic Arts skills have fused together to create my designs that I have made available to you through Zazzle, CafePress, Greeting Card Universe, Snapfish, and Fine Art America. Currently, I have almost 100 Dog Breeds that are represented in my designs. If you do not see your favorite Breed, please contact me and I will make sure to create it for you. Or, If you would like to see YOUR OWN PET inside any of my designs, let me know and I'll get it done at no additional charge to you. Please enjoy your visit and by all means share your favorite items on your FaceBook or other social network that you may belong to. Please also, make sure to LIKE me on FaceBook. But wait, there's more ... Do you or your pet have a Birthday coming up? Would you like to receive a personalized Paper (not digital) Greeting Card in the mail? Simply send me your address by clicking on the Contact link. Better yet, this will also add you to my mailing list to receive holiday postcards through the year! Cut and Paste Code into Your Page! I am happy to exchange links. Just place the above link into your website and send me an email with where it appears and the info for your link. Wishing you all a safe and happy Labor Day 2011! You can find many of my holiday greeting cards at Fine Art America. Daily Photo - LOOK! A Mini Me! © 2009-2012 Renae Frankz Frankz Paw Printz. Simple theme. Powered by Blogger.